I am a desperate fan of Hilary Mantel's superbly researched, intricately crafted, slippery novels, Wolf Hall and Bring Up The Bodies. Though a Catholic, I have been surprised and fascinated by her sympathetic depiction of Thomas Cromwell and critical depiction of Saint Thomas More. Growing up in England where the history of the Tudors looms large in our school curriculum, our TV history and costume dramas, it was astounding to find someone who had a genuinely fresh perspective. What was even more impressive was Mantel's technical achievement to situate us so firmly in Cromwell's perspective and position, and to make this famous historic period seem contemporary and fresh. We don't meet Henry VIII or Anne Boleyn until Cromwell meets them. His own domestic vicissitudes loom large. Business, politics, religion - all seem vital, close, real and urgent rather than faded, distant and epic. And Mantel's great historic figures are real people with their weakness, moral failings, occasional nobilities, suffering and humour. The greatest example of this is her treatment of Cardinal Wolsey. He isn't just a rapacious, arrogant, power-hungry bogeyman but a fragile and fallen, perhaps delusional optimist who deserves our sympathy and Cromwell's fierce loyalty. The challenge for any adaptation of the what will eventually become three novels is how to keep that sense of freshness, and how to keep Cromwell's perspective. And in the case of the BBC's new six part adaptation of the two densely written published novels: how to condense the material without losing its sophistication, and how to present it for a prime time audience without dumbing it down. I have seen the first two episodes of WOLF HALL and I can confirm that director Peter Kosminsky (THE GOVERNMENT INSPECTOR) and writer Peter Straughan (FRANK) have kept faith with Mantel and all her readers: this adaptation is dense, uncompromising, and centred firmly on Cromwell. In the two episodes I watched we see the ignominious fall and untimely death of Cardinal Wolsey - booted out for failing to get Henry VIII the annulment that which allow him to marry Anne Boleyn. And we see the rise of Thomas Cromwell - first a humble petitioner to King Henry, then the man currying favour with his apparent candour and promises of shaking down the monks for cash. As the two episodes end, Cromwell witnesses the satirical mask mocking his beloved Wolsey and is set upon his revenge. The episodes have a slow pace that belies the dense content. They also have a convoluted structure, particularly in the first episode, which flashes back from the present day (1529) to Wolsey's earlier triumphs, Cromwell's childhood and Queen Catherine's trial. I've read the books and was paying close attention but even I had trouble keeping up and so did my friend, who hadn't read the books at all. Sometimes we had captions to indicate the time and place, but often not, and the director chose not to indicate the different time periods via visual style. I also wonder how viewers who haven't read the novels will react to a lead character who is so much of an enigma, certainly in the first episode. The whole point of Cromwell in the first episode is that he slips into the shadows, and never lets a word escape his lips that's uncontrolled. But those are small criticisms for am historical drama of superior quality and ambition. Started behind the camera lens, one has to admire director Peter Kosinski for translating Mantel's immediate style to the screen. He has a shooting style that is dynamic and fluid rather than staid and self-consciously grand. Most of the action takes place in authentic historic palaces and gardens and the interior scenes are intimately lit, and lushly dressed, without feeling stagey. When you're in Cromwell's house, watching his daughter sit on his knee and read a book as his wife clears up breakfast, it feels like a family really lives there. Best of all, Kosminsky conveys Cromwell's perspective by often shooting over his shoulder as he leaves or enters a room, rather than by using a more obvious voice-over. In front of the lens, Kosminky benefits from an all-star cast. Mark Rylance has to be one of our greatest stage actors and he conveys the multi-faceted, enigmatic nature of Cromwell without being distant. You can see why he is loved by his family and why even Norfolk chuckles at his audacity while admonishing him. Claire Foy (the revival of UPSTAIRS, DOWNSTAIRS) is wonderfully prickly and pompous as Lady Anne Boleyn and I'm curious to see whether she can modulate that to gain our sympathy in the later episodes. 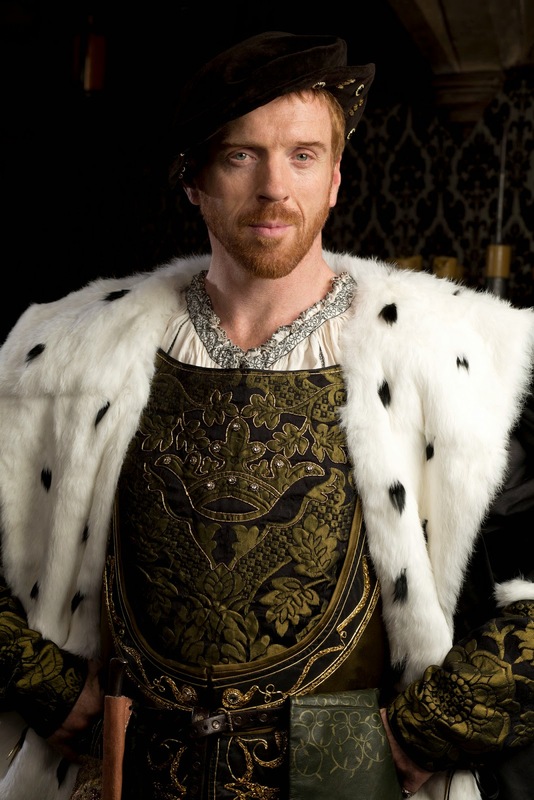 Damian Lewis (HOMELAND) looks perfect as Henry VIII and in Mantel's reading, comes across as embattled, fragile, and vulnerable. Anton Lesser's Thomas Moore is a censorious prig and Mark Gatiss' Stephen Gardiner, quite simply, hilariously bitchy. The only actor I thought miscast was Jonathan Pryce who seemed altogether too lightweight, whimsical and puffed up to be the most powerful man in England, even if on his way down. There was something about his manner of speaking that felt anachronistic, even in a drama that was trying to sound unselfconscious. It just felt wrong. Overall, WOLF HALL looks like a handsome and intriguing production. It has its flaws but it's also compelling and perhaps Mark Rylance's greatest TV role to date. It will, I feel, repay careful and repeated viewing and will require much more brainwork than your typical prime time costume drama. For that, we must be thankful to the BBC who have clearly resisted the temptation to dumb it down. The first episode of the series, "Three Card Trick", alternates between two time periods. In the current time period, 1529, Henry VIII casts off his Lord Chancellor Cardinal Wolsey for failing to have convinced the Pope to declare Henry's marriage to Catherine of Aragon against God's law, so allowing Henry to marry the prickly and calculating Lady Anne Boleyn. The fragile, incredulous Wolsey is unceremoniously dumped in Esher Place and stripped of his lands and power. Only Cromwell is willing to petition the King on his behalf. In the previous time period, beginning at around 1523, we see flashbacks explaining how Wolsey fell. We see why Anne blames him for her abortive attempt to marry Harry Percy in 1523, and how each successive plan of his to arrange the annulment failed because Queen Catherine's nephew, the Holy Roman Emperor, has the Pope captive. We see Cromwell as an underestimated, shadowy figure. Like Wolsey he's mocked for his low origin and mistrusted. Henry VIII is seen only briefly, observing the trial of Catherine that ended in his defeat. But as the episode ends we take the full measure of Cromwell as he meets his nemesis, Anne Boleyn, back in 1529. We see that he suffers no fools, has a wicked sense of humour, and is typically condescended to. We also see that he is hard to read - what is he really thinking? King of England, France and Lord of Ireland. The second episode of the series, "Entirely Beloved", focusses mostly on events in 1529. Wolsey is chased North to dismal York by the Dukes of Suffolk and Norfolk while Cromwell steps up his campaign to win the King's trust by speaking honestly and wisely, promising what the King wants - money, and an annulment. By the end of the episode he has been appointed to the Privy Council and become the key advisor to a fragile, vacillating and psychologically imprisoned King. We learn far more about Cromwell the man - how beloved he is by his family but also how enigmatic and imposing he can be. He speaks many languages, has skills from shoeing a horse to fighting in battle, and has scraped his way up in life. As the episode ends, Wolsey has been arrested by Anne's former love Harry Percy, and has died on his way south to the Tower of London. We close on a pivotal scene from the novels: four men dress as wolves and taunt the Cardinal in a satirical masked theatrical at court. Cromwell will be revenged on the pack of them. 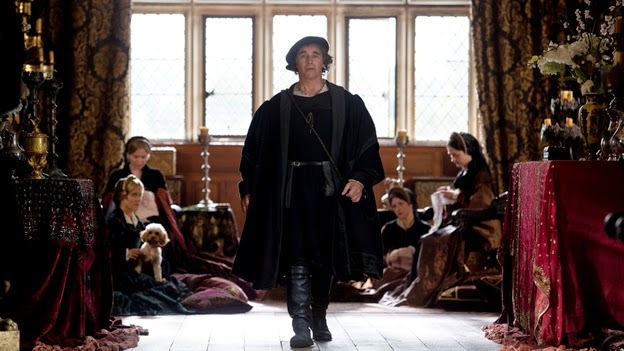 Wolf Hall will be broadcast in the UK on BBC Two, starting on Tuesday 21st January at 9pm. It will be shown in the USA on PBS on April 5th.